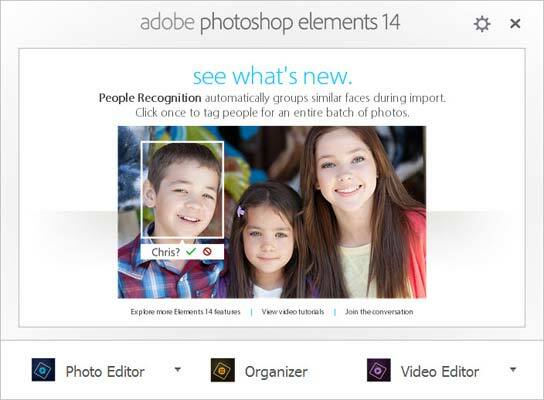 Adobe Photoshop Elements 14 is the sibling of Photoshop, this latest version has matured into a worthy image editing application that can easily hold its own against most other packages. 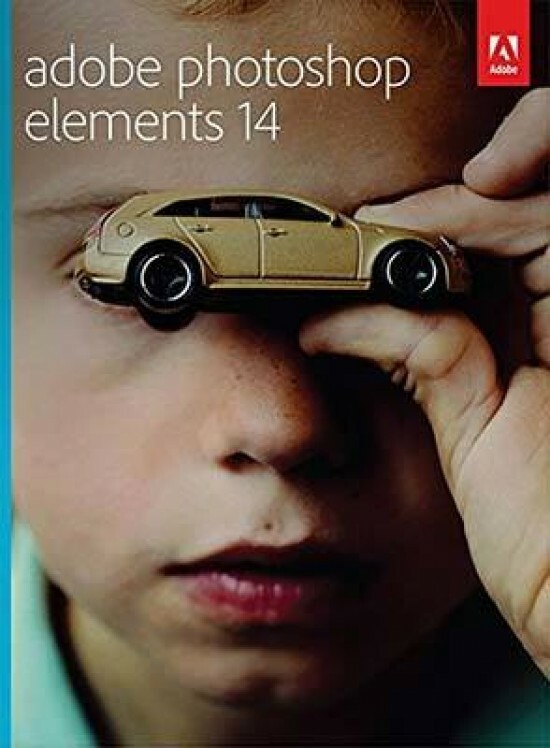 Adobe Photoshop Elements 14 has an RRP of £79.99 / $99.99. 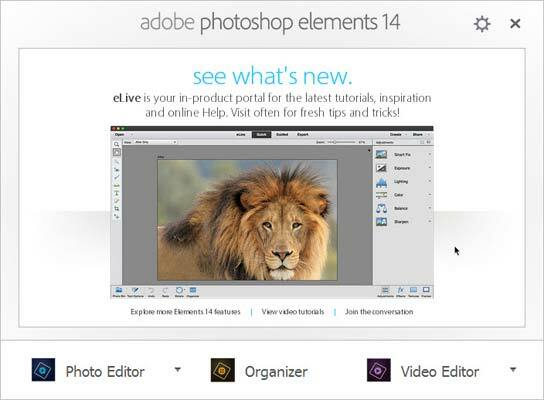 On launching PSE 14 an animated welcome screen highlights the new and enhanced features. 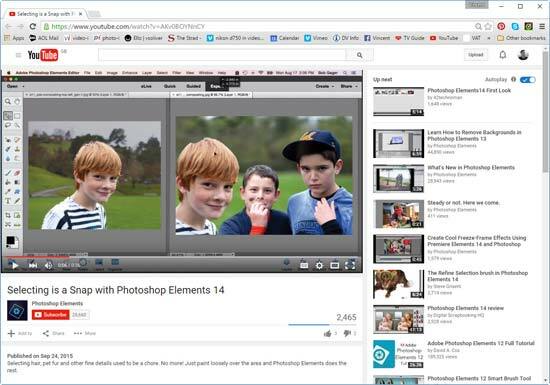 Directly below are three options; Photo Editor, Organizer and Video Editor. 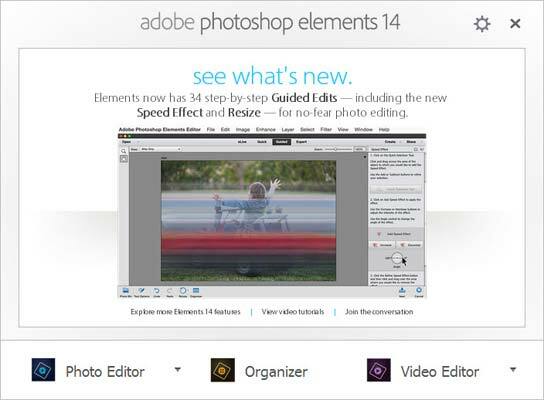 The last option is a link to Download a trial version of Premiere Elements 14 or Install it from a DVD if you purchased the package deal. The application Launch screen with information on what's new and enhanced. 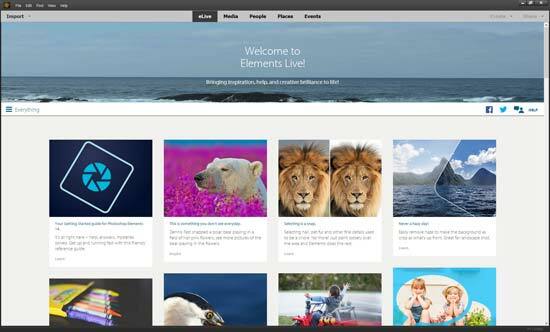 Clicking the Organizer button launches the Elements Live screen, from here click on any of the images to take you to a web page or video tutorial with information on how to use the selected feature. The content is constantly updated from within Elements, an internet connection is required for this. The eLive screen, tutorials, tips and videos from multiple sources are listed here, click on a image to open relevant information on the task. Some of the tutorials may be on YouTube or other web sites. The second menu option "Media" takes you to your folders or albums. Photos in the Folder hierarchy are not automatically added, you must right click on a folder and select Import Media, importing is very fast. It took 4 minutes to add 16,535 images and movie files contained in a folder and subfolders. Once added you can view photos in their original folders or organize your photos into Album's for easy access. 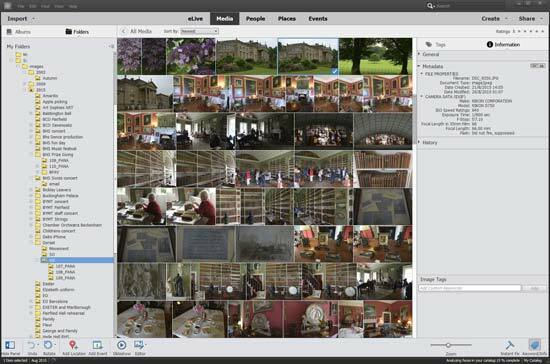 The advantage of creating an Album is that collections of photos can easily be viewed together, e.g., you may want to view; holiday, Landscapes or people photos that are stored in multiple folders. 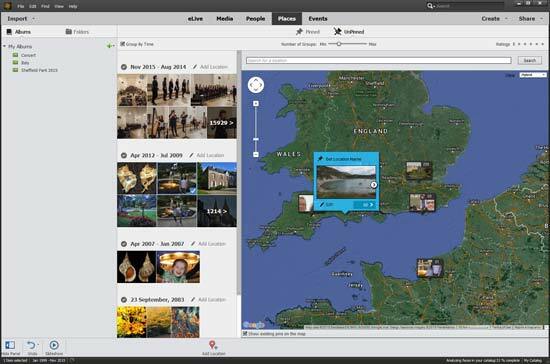 Simply create an album and add photos to it regardless of where they are stored. 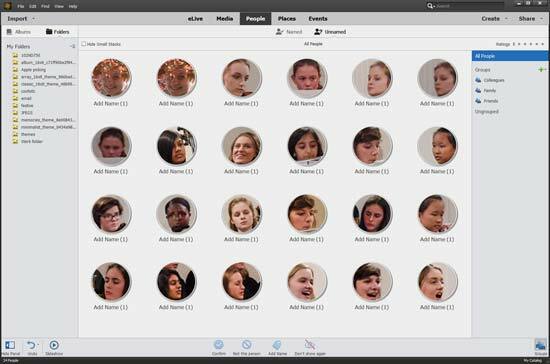 The Media Organizer, add folders and subfolder to the list to view images and video clips. Create albums of photographs that may be stored in multiple folders. Photos in an album can be rearranged by using the "Sort By" drop down list and select Album Order. 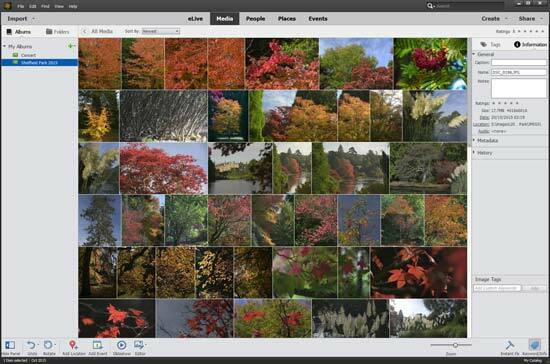 A slideshow can be created from within the organizer from all or just selected photos, with a maximum of 512 photos. Press the Slideshow button to view the images, the edit button at the bottom of the screen enables access to various options. A Slideshow Builder screen opens, rearrange images to a required sequence. People can be tagged and when subsequent photos are imported names can be added to an entire batch of photos. Captions for each photo can be added as well as a Text slide, although the text slide doesn't give any Font or colour options. A few custom Themes are included to suit most occasions, these present your photos as animated slides with either pan or zoom effects. Most of the templates are lacklustre in presentation with no user control and most images are displayed for far too short, generally two or three seconds The supplied elevator music also leaves a lot to be desired, although you can add your own MP3 sound file via the Audio button. The slideshow can be exported to a folder or to FaceBook. The location of where you took the photos can be added to a Google Map. Other options in the Organizer include People; this finds faces in a set of photographs which you can tag, Places, add locations to indicate where the picture was taken and image markers are added to a map. The final option is to add an Event to your photos, this could be used to highlight a special occasion or concert etc.